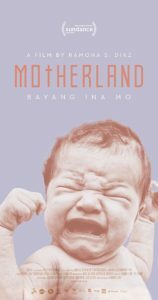 MOTHERLAND takes us into the heart of the planet’s busiest maternity hospital in one of the world’s poorest and most populous countries: the Philippines. The film’s viewer, like an unseen outsider dropped unobtrusively into the hospital’s stream of activity, passes through hallways, enters rooms and listens in on conversations. At first, the surrounding people are strangers, but as the film continues, it’s absorbingly intimate, rendering the women at the heart of the story increasingly familiar. In a hospital that is literally bursting with life, we witness the miracle and wonder of the human condition. Diaz, a veteran documentarian began filming in the search of a story on reproductive justice, visited the Dr. Jose Fabella Memorial Hospital in Manila, Philippines. As the busiest maternity ward in the world, it averages 60 births a day—and at its peak, as many as 100 babies within a 24-hour period. Fabella Hospital is the final safety net for very poor pregnant women, most of whom cannot afford either contraception or the $60 delivery fee. Immersing the viewer with a fly on the wall cinema verité approach,” MOTHERLAND – winner of World Cinema Documentary Special Jury Award for Commanding Vision at Sundance will open on September 22 in Los Angeles at the Laemmle Monica Film Center. Director Ramona Diaz stops by to talk about her immersive, intimate film that finds intimacy and caring in the midst of controlled bedlam. MOTHERLAND director Ramona Diaz will participate in brief Q&A’s opening weekend at the Monica Film Center: FRIDAY, 9/22, 7:30 PM screening; SATURDAY, 9/23, 5 PM and 7:30 PM screenings; SUNDAY, 9/24, 2:30 and 5 PM screenings. Marrying stunning visuals with social advocacy, Rahul Jain’s debut documentary — winner of the Special Jury Award for Cinematography at the 2017 Sundance Film Festival — takes audiences into the labyrinthine passages of an enormous textile factory in Gujarat, India. Jain’s camera wanders freely between pulsating machines and bubbling vats of dye to create a moving portrait of the human laborers who toil away there for 12 hours a day to eke out a meager living for their families back home. Interviews with these workers and the factory owners who employ them reveal the stark inequality and dangerous working conditions brought about by unregulated industrialization in the region. This political message is delivered amidst the unsettling beauty of the factory’s mechanical underworld and the colorful, billowing fabrics it produces. 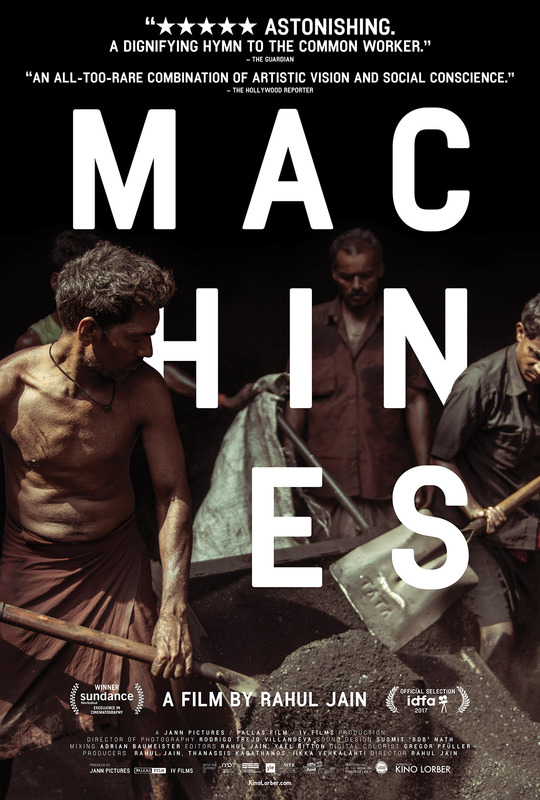 Director Rahul Jain joins us to talk about the making of his stark, mesmerizing, and unsettling film and the penetrating sense of complicity we all should feel about the inhumane work conditions these men find themselves in. Strong Island chronicles the arc of a family across history, geography and tragedy – from the racial segregation of the Jim Crow South to the promise of New York City; from the presumed safety of middle class suburbs, to the maelstrom of an unexpected, violent death. It is the story of the Ford family: Barbara Dunmore, William Ford and their three children and how their lives were shaped by the enduring shadow of race in America. In April 1992, on Long Island NY, William Jr., the Ford’s eldest child, a black 24 year-old teacher, was killed by Mark Reilly, a white 19 year-old mechanic. Although Ford was unarmed, he became the prime suspect in his own murder. 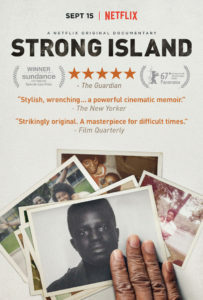 A deeply intimate and meditative film, Strong Island asks what one can do when the grief of loss is entwined with historical injustice, and how one grapples with the complicity of silence, which can bind a family in an imitation of life, and a nation with a false sense of justice. Director Yance Ford, who is transgender, is a recipient of the Creative Capital Award, a MacDowell Colony Fellowship, a Sundance Documentary Film Program Fellowship, and was among Filmmaker Magazine’s 25 New Faces of Independent Film in 2011. For ten years Ford was privileged to work as Series Producer for the PBS showcase POV and where his curatorial work helped garner more than 16 Emmy nominations. Ford is also an architectural welder, and while at Modern Art Foundry he helped assemble the sculpture “Maman” by Louise Bourgeois—the series of three spiders exhibited at Rockefeller Center, and now on permanent display at the Guggenheim Museum in Bilbao, Spain. Director Yance Ford joins us for a conversation on grief, justice, racism, expectations, and the profound impact this 25-year long saga has had on his family. 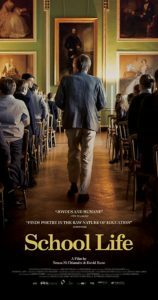 This observational documentary follows a year in the lives of two inspirational teachers at Headfort, the only primary-age boarding school in Ireland. Housed in an 18th century estate, school life embraces tradition and modernity. For John, rock music is just another subject alongside Maths, Scripture and Latin, taught in a collaborative and often hilarious fashion. For his wife Amanda, the key to connecting with children is the book, and she uses all means to snare the young minds. For nearly half a century these two have shaped thousands of minds, but now the unthinkable looms: what would retirement mean? What will keep them young if they leave? Co-directors David Rane and Neasa Ni Chiandain stop by to talk about gaining the trust of a remarkably dedicated couple who have given their lives to the students and a way of life at Headfort and the joy of documenting an academic culture that celebrates and elevates young minds. Winner of 16 festival awards – from Audience Choice to Best Feature/Actress/Music and Screenplay – YEAR BY THE SEA chronicles empty-nester Joan Anderson’s (Karen Allen) decision not to follow her relocated husband to Kansas. Instead, she retreats to Cape Cod to rediscover herself and redefine her life. Plagued with guilt, she questions her decision until stumbling upon a spirited mentor, Joan Erikson (Celia Imrie) – author and wife of famed psychologist Erik Erikson (Alvin Epstein), who coined the term “identity crisis.” With a support group that includes her literary agent and a host of locals, Joan learns to embrace the ebb and flow of life – ultimately discovering the balance between self and sacrifice, obligation and desire. 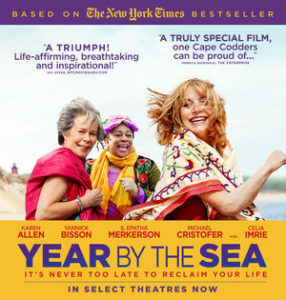 YEAR BY THE SEA, based on the New York Times and international best-selling memoir by Joan Anderson and starring highly acclaimed screen and stage actress Karen Allen (Raiders of the Lost Ark, Animal House). Written, directed and composed by Alexander Janko, YEAR BY THE SEA will open at Lincoln Plaza and Landmark Sunshine in New York on September 8 and at Laemmle Royal, Town Center and Playhouse 7 in Los Angeles on September 15. Director Janko joins to talk his life-affirming tale of friendship, love and pushing against expectations. 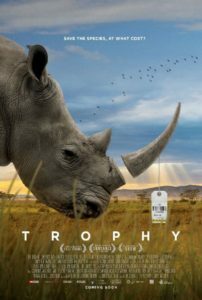 In filmmakers Shaul Schwarz and Christina Clusiau’s bracingly balanced new documentary TROPHY explores the complex heart of contemporary issues of animal conservation and commodification at a time when endangered African species such as elephants, rhinos and lions march ever closer to extinction. This provocative follow-up to Schwarz’s acclaimed Narco Cultura journeys viewers across lush African forests and vast plains and into the world’s largest hunters’ convention in Las Vegas to meet breeders and hunters who passionately believe in animal conservation. A common mantra of these businesses – “if it pays, it stays” – sums up the controversial notion that if you assign monetary value to an animal, it is worth protecting. TROPHY follows Philip Glass, a Texas-based sheep breeder and life-long hunter who is on a quest to collect the “Big Five” (elephant, buffalo, lion, leopard, and rhino). Philip is deeply connected to the land and animals, Chris Moore, a Zimbabwean wildlife officer whose anti-poaching campaign is partially subsidized by big-game hunters like Philip. Chris works with government authorities and communities to keep people safe from wild animals. He also protects those animals from ruthless poachers. The great irony of Chris’s work is that he goes to “extreme lengths” to protect endangered animals, only to have them killed by trophy hunters. Co-director Christina Clusiau and Shaul Schwarz joins us for a frank conversation on the fate of these magnificent creatures and who or what will determine their uncertain future. Dolores Huerta is among the most important, yet least known, activists in American history. An equal partner in co-founding the first farm workers unions with Cesar Chavez, her enormous contributions have gone largely unrecognized. Dolores tirelessly led the fight for racial and labor justice alongside Chavez, becoming one of the most defiant feminists of the twentieth century—and she continues the fight to this day, at 87. With intimate and unprecedented access to this intensely private mother to eleven, the film reveals the raw, personal stakes involved in committing one’s life to social change. 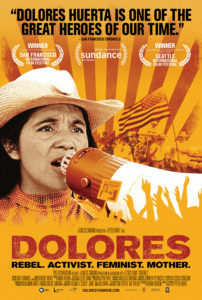 DOLORES is directed by Peter Bratt (LA MISSION) and Executive Produced by humanitarian and Grammy Award-winning musician Carlos Santana. The film debuted at the Sundance Film Festival this year and continues to be a favorite on the festival circuit, garnering Audience Awards at the San Francisco International Film Festival, Montclair Film Festival, Houston Latino Film Festival and the Denver Women + Film Festival, as well as receiving the Golden Space Needle Best Documentary Award from the Seattle International Film Festival. Director Peter Bratt joins us for an engaging and lively conversation about a visionary leader who refuses to give into to pessimism and inaction. Crossett, Arkansas is home to about 5,500 people, one Georgia-Pacific paper and chemical plant owned by billionaire brothers Charles Koch and David Koch, and a startling rate of cancer and illness. The groundbreaking investigative documentary Company Town follows local pastor David Bouie as he fights to save his community. It offers a rare look inside a small town ruled by a single company, where the government’s environmental protections have been subverted and ignored, leaving its citizens to take on entrenched powers in a fight for justice. Crossett is just one of hundreds of towns across America polluted by big business and failed by local, state and federal environmental protections. Company Town ultimately asks, what do you do when the company you work for and live next to is making you sick? It is the story of a modern-day David vs. Goliath. 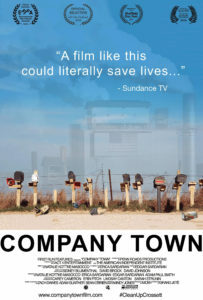 Filmed over the course of nearly four years, Company Town offers first-hand accounts from a wide range of residents in Crossett’s “cancer cluster,” including Simone Smith, who was diagnosed with cancer at 9 years old; Hazel Parker, a former Georgia-Pacific employee whose mother, sister and father died from cancer; and Leroy Patton, the only person on his block to survive his health battle. And it brings to light the account on one whistle-blower who puts his life and family on the line to shed light on Georgia-Pacific’s egregious pollution, cover up and political influence. Co-directors Natalie Kotke-Masocco and Erica Sardarian join us to talk about their quietly devastating film about corporate greed, corruption and malfeasance. New nations are rarely born in peace… India, 1947: Lord Mountbatten (Hugh Bonneville) is dispatched, along with his wife Edwina (Gillian Anderson), to New Delhi to oversee the country’s transition from British rule to independence. Taking his place in the resplendent mansion known as the Viceroy’s House, Mountbatten arrives hopeful for a peaceful transference of power. But ending centuries of colonial rule in a country divided by deep religious and cultural differences proves no easy undertaking, setting off a seismic struggle that threatens to tear India apart. 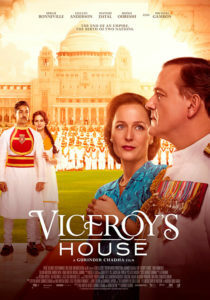 VICEROY’S HOUSE delves into the “upstairs/downstairs” real-life history of Lord Mountbatten and his family in 1947 India from the perspectives of both the Mountbattens and the people of India. The story of India’s partition is not only a story of independence, but also one of the greatest refugee crisis in history. With sumptuous period detail, director Gurinder Chadha (Bend It Like Beckham) brings to life a pivotal historical moment that re-shaped the world.